You wouldn’t think bus steps could be so important. Believe it or not, in London, the spiritual home of double-deckers, people die each year from falling down the stairs. So BCI has designed its new double-decker to prevent that from happening. "In the traditional way, the steps will go straight down," BCI’s Chris Cordia says. "It will be one flight of stairs – so, when standing at the top of the stairs as the bus takes off, and if you’re not really holding on, you could fall a long way. Nothing is going to stop you." But that can’t happen with the BCI double-deckers, which are already running around the London area courtesy of British bus operator and dealer, Ensign. "The staircase in this bus is a compact, short fall design," Cordia continues. "We have two steps down to a landing, then another five steps down to a landing, and then you turn again. "The landings themselves are square, they’re not a feathered-out step, so when you step down to turn you have solid footing. "The distance from the start of the step to the back wall on the step is very short, so if someone does fall, they’re not going to fall far. 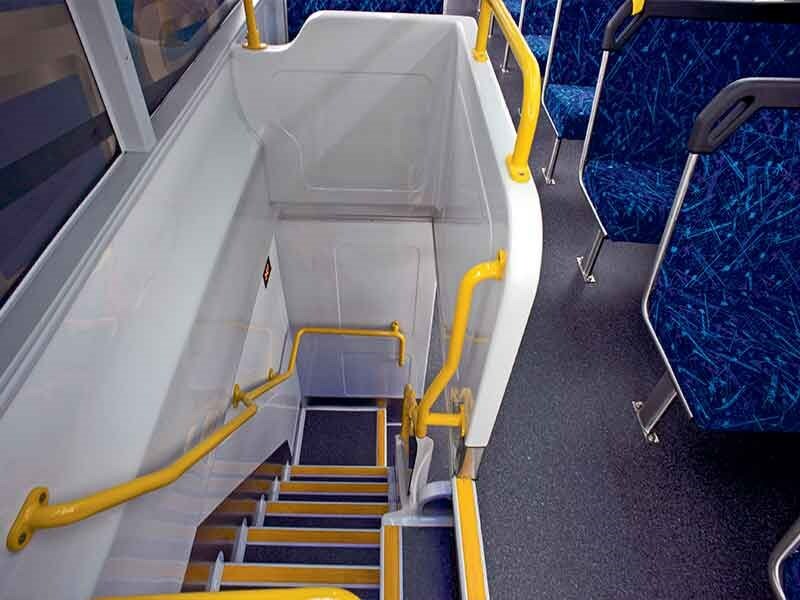 "The stairs have been designed with safety in mind and of course it’s compact, so you have more room upstairs and downstairs for passengers, and more room for wheelchair access. It’s a very well-thought-out system." In fact, ABC found the whole bus to be impressive on our recent test drive in Melbourne. It has a quality feel about it. The same couldn’t be said about BCI buses of old. But this double-decker shows how far BCI has come in the 25 years since Ron Nazzari kicked off in Perth, where the company is still based, with dealerships in each state and territory and in New Zealand. BCI has operated out of its own purpose-built factory at Xiamen in China since 2011 under an Australian team led by well-known industry designer Boyd Denning. "Since we have established our own factory we now have complete control over our product," says Cordia, who has a technical background and is a knowledgeable ambassador for the company. "We’re not buying a product from someone else and adapting it from their design. "This is our design, it’s been developed and built by our own team. Our team runs the factory, our team lives there and controls all aspects of that build. "Our Australian design team knows the Australian market and are building buses for Australian conditions. All the buses that are built at BCI are export-only products, nothing is sold into China. So we’re building for export markets only. "We train our workforce to do things the way we want them done, and pay our workers by the hour, not per unit, so the benefit there is they can slow down and take more time to do things properly. "Our wiring looms are all done in-house, so we have complete control over our wiring loom manufacturing process now. Previously the wiring looms were outsourced." 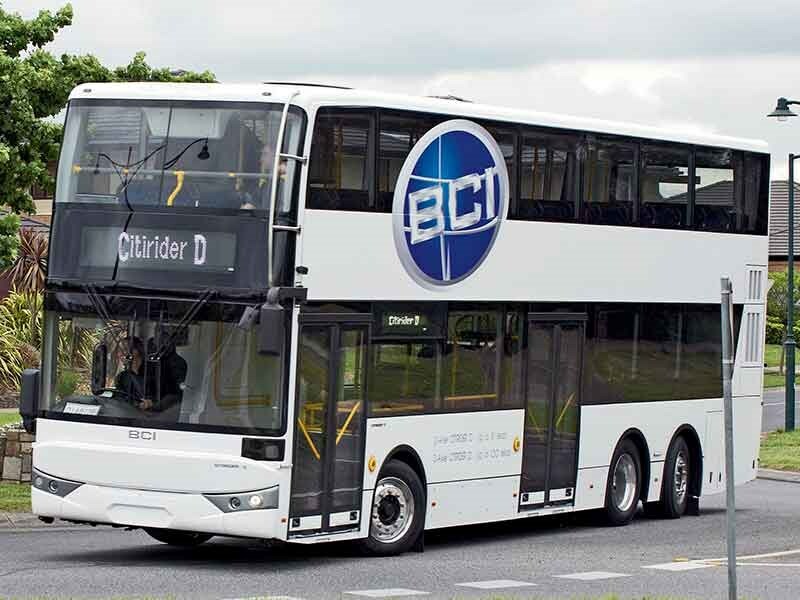 This is the very first BCI double-decker in Australia. The version we drove is 11.8 metres, but you can go for a 12.5m or 10.8m 2-axle model as well. 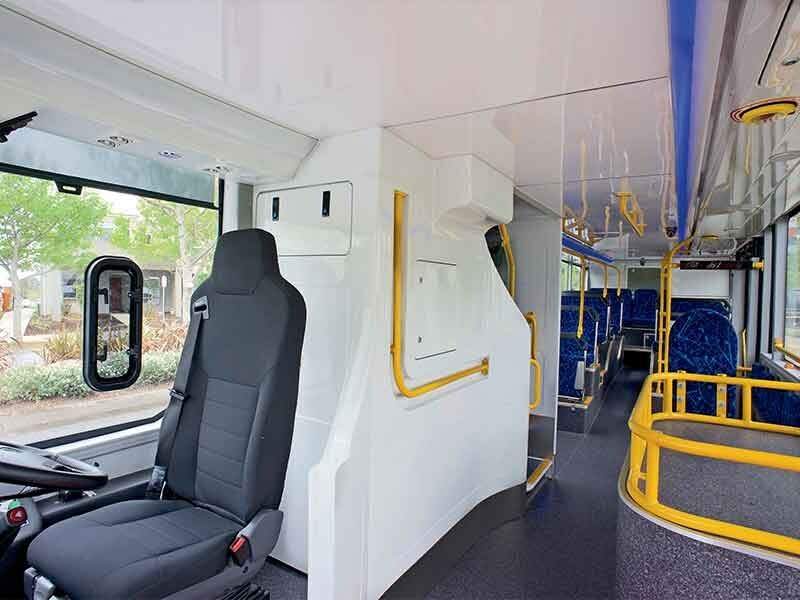 BCI is one of only a few manufacturers able to supply double-deckers to the Australian market, which has a growing appetite for high-rise commuter units, at least in Sydney and Melbourne. "It’s going to start taking off," Cordia says. "The main reason is the congestion in our cities. We need the high capacity. "The other option is an articulated bus which works very well but sometimes parking in areas such as the airports is very hard. So a bus like this, only 11.8 metres, it’s no bigger than a standard school bus. You can get in to all the same spots but you can load up to 100 people [seated] depending on the spec." You can go for the open top tourist option too, if you like, and you can even run this vehicle as a school bus with the option of ADR 68 compliant high-back seats with seat belts. BCI insists this double-decker will go the distance in Australia. "Because this bus is designed to last for 25 years, we have gone with the best quality we can possibly get," Cordia says. For example, the frame uses Australian-spec galvanised steel, which is 200-micron thick coated, not the usual 100-micron thick coating more commonly used. Also: "The stretch panels are fibreglass and bonded to the frame, they’re not screwed on, so there are no little screw holes and points for rust to begin." There are fibreglass front and rear headers, and all the lower bolted-on panels – which are the most likely to get hit – are aluminium. The monocoque design means it’s an integrated body and chassis, which BCI says is good for strength and weight. "Manufacturing is straightforward that way," Cordia says. The Australian-designed, Chinese-built bus adds the international flavour of an American power plant and German gearbox. 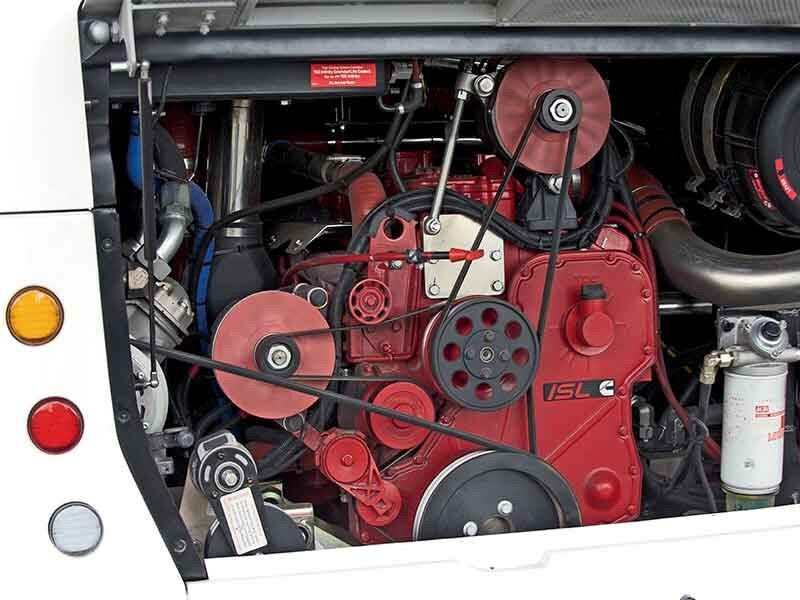 The engine is the ubiquitous 6-cylinder, 8.9-litre Cummins ISL with Euro 5 emissions. It’s rated to 340hp (250kW) with about 1500Nm of torque. The ISL is matched to a 6-speed ZF ‘Ecolife’ fully automatic transmission. The steering box and rear axle are ZF. However, the independent front suspension is by Chinese manufacturer Jinben. The wheels are Alexa alloys with low-profile tyres. Cordia says BCI has been using Jinben and Alexa products for many years "and they have proven to be very good". The front wheels and steerable tags are super singles, and that’s mainly for their higher weight-carrying capacity. But, if desired, they can be changed to more standard 275/70R22.5 all round, pending customer specific requirements. We found this double-decker to be great to drive. There’s plenty of torque and the transmission is smooth with an excellent three-stage retarder. We threw it into a roundabout at Pakenham a few times and were pleasantly surprised by how stable it is for such a tall bus – it seemed no different to a single-decker. That’s thanks to a low centre of gravity, stabiliser bars and load-sharing suspension with eight air bags. Adding some peace of mind but not complacency was the fact that the model has been rollover tested in China, and has electronic stability control (ESC) as part of the Wabco electronic brake system (EBS). The all-round disc brakes are by Knorr. Manoeuvrability is good courtesy of the steerable tag axle. The bus cruised along the freeway at 100km/h with no problems at all, sitting on the edge of the green torque/economy band at 1800rpm. Most importantly, it steered and handled very well and felt stable despite the heavy rain. 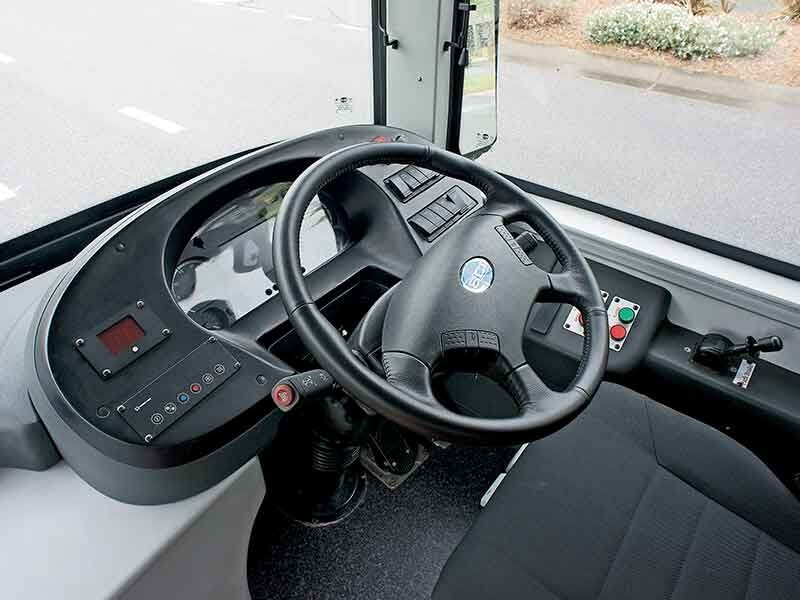 The Isri driver’s seat with air lumbar support is great, as is the blind-spot vision. The passenger experience is pretty good too. There was no vibration up the back downstairs, and the noise level was expected but acceptable. Upstairs was quiet with surprisingly good headroom – 1.8 metres with 2.1 metres on the entry downstairs, declining down the back of the bus, of course, because of the tag axle. However, there is a smooth floor to the back with no step. The standard seats on board were BCI’s own brand (TST) and we found them comfortable enough, but you can order whatever seats you want. BCI says quality features include Hella lights, formica internal panelling, and a special type of vinyl flooring. There is roll-on wheelchair compliance, cameras galore, and an upstairs passenger indicator using sensors on the staircase. The only downsides that I could spot in this bus were minor. One was upward adjustability of the steering wheel – at the comfortable position for me, the speedo was slightly obstructed. The other was the pressure needed on the foot brake when stopped at lights or intersections.